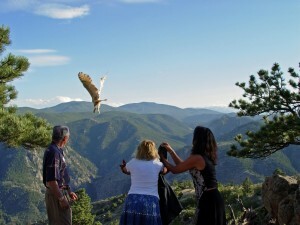 The Rocky Mountain Raptor Program inspires the protection and appreciation of raptors and the spaces where they live through excellence in rehabilitation, education, and research. During the past 25+ years we have admitted more than 6,000 injured eagles, hawks, falcons, and owls, providing them the necessary rehabilitative care to return them to the wild. We now release more than 80% of all treatable birds to give them a second chance at freedom. Dedicated staff and 150 volunteers work tirelessly every day of the year to care for these magnificent creatures, and to make a difference in our world. We use these activities, along with the help of 27 non-releasable birds of prey, to educate the public about the importance of wildlife in our world and promoting good stewardship of the planet. Over the years we have touched several million people with our message, and inspired hundreds of thousands of children about the wonders of wildlife. Your support of the RMRP through a vehicle donation with Cars Helping Charities will help provide critical funds to pay for the medical and rehabilitation care these injured birds need, and support our efforts at environmental education.